Phil Coturri followed his heart from San Francisco to Napa, where he has become one of wine country's most sought-after sustainable grapegrowing consultants. Growing up in San Francisco in the 1960s, Phil Coturri read Jack Kerouac, listened to the Dead and smoked a little grass and, like many in his generation, ran away from the city for a life in the country. "To live off the land, isn't that a hippie's dream?" Coturri, 62, said. "That's how I got involved growing grapes." With his ponytail and scraggly beard, Coturri sure looks the part of the aging hippie, but no tie-dyed slacker is he. Coturri is the go-to vineyard manager for organic and biodynamic farming in Napa and Sonoma. His client list includes winemakers Andy Erickson, Morgan Twain-Peterson, Bob Levy at Harlan Estate, Richard Arrowood, as well as Araujo Estate under the new ownership of Château Latour's Pinault family. It seems appropriate to tell Coturri's story on the 45th anniversary of the first Earth Day. He has been devoted to organic farming for nearly that long. He and his brother Tony helped their dad plant a 2-acre vineyard at the family's weekend home in Glen Ellen in 1967. His interest in organic farming grew and by 1979 he started Enterprise Vineyards, which today farms 700 acres and has 160 employees. Robert Kamen, who is the writer behind movie hits like Taken, The Karate Kid and The Transporter, is an old friend and Coturri planted his vineyard in 1983. "I was amazed at how intuitive he was about land use and vine positioning and drainage," said Kamen, who has his own label, Kamen Wines. "He had a vision for this vineyard." While Coturri might not dress the part of the fastidious perfectionist, he is meticulous to detail in the vineyard. And that doesn't come cheap. Just ask Kamen, who wryly said; "Every time I ask Phil why we're doing something in the vineyard, he says, 'I got a kid in college.'" Coturri avoids synthetic pesticides and herbicide and doesn't use fertilizers, even organic ones, preferring cover crops like bell beans instead. Beehives, owl boxes and raptor roosts are standard for promoting healthy vineyards. While Coturri offers biodynamic farming to clients, he doesn't necessarily believe in its spiritual side. "I was raised Italian Catholic; I don't need another religion," he said. Organic in Coturri's case, is also high-tech. Vineyard teams carry tablet computers that help monitor the vines, connecting them to soil sensors and other devices. Coturri works with a dual irrigation system that allows him to water an entire vineyard or just tiny sections at a time. "I'm using about 50 percent of the water I used 10 years ago," he said. Brother Tony has long made wine under the Coturri label but now Coturri and his son Sam have started their own label, Winery Sixteen 600. He was also instrumental in the 2013 approval of Moon Mountain District American Viticultural Area (AVA). The AVA is basically a crater of dormant volcano, which sits above and to the east of Sonoma Valley. It's a rocky terrain with shallow soils and only about 1,500 acres of vines planted. "I farm 400 of those," Coturri said. Coturri credits much of his success to timing. He was in the right place at the right time. "What we did in the back-to-the-earth movement was not in the mainstream at all," he said. "But those techniques have become part of the mainstream." Somehow, though, I doubt Coturri ever will. This was a great idea to focus on Earth Day! 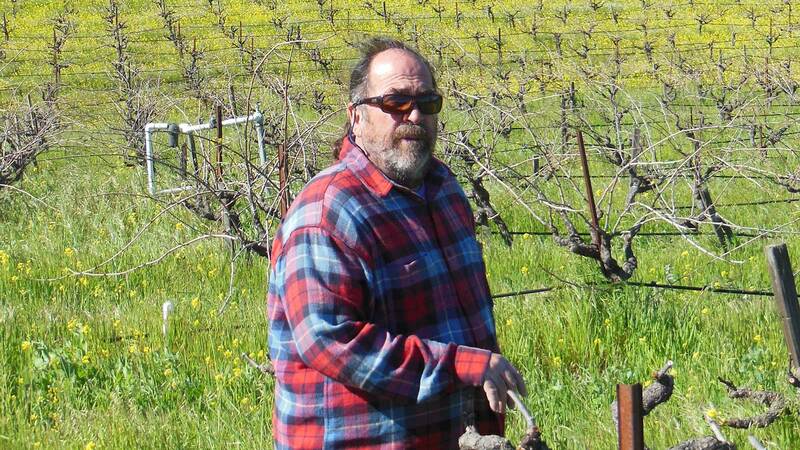 Phil Coturri is very well known in Sonoma Valley for farming vineyards organically for a long time! I have also begun to farm my vineyards Bio Dynamically as of last year. I really do believe it makes better wine and is much better for the environment than conventional farming! Hat's off to Phil being a pioneer and a tireless advocated for farming organically. I met Phii Coturri when I was working with Richard and Alis Arrowood during the time Robert Mondavi partnered with the Arrowoods in the early 2000s. Richard said then that Phil was "the best of the best" when it came to sustainable vineyard farming. The afternoon we spent with Phil in the vineyard was both total fun and incredibly enlightening. Phil may have a laid-back sixties attitude, but considering his success and continued dedication to organic and biodynamic vineyard farming, he's more than proved how important it is to the wine industry.